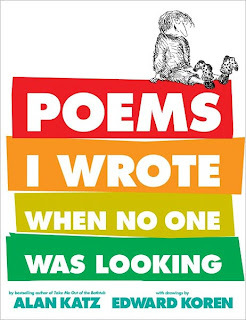 GoodReads Summary: Bestselling author Alan Katz, of Silly Dilly fame, knows kid humor, and he knows just what subjects are funniest—from school to siblings to sports, this assortment of spirited poetry has something for everyone. In the tradition of Shel Silverstein and Jack Prelutsky, with black-and-white illustrations throughout, this collection of more than 100 poems will have kids roaring with laughter! What I Think: In my effort to read more poetry in 2012, I grabbed this book at the library. I had a feeling it had the potential to be very Shel Silverstein-ish but it's really not even close. I grew up with Shel Silverstein and can vividly remember reciting "Sara Cynthia Silvia Stout" and "Ickle Me, Pickle Me, Tickle Me, Too" by heart. Maybe it's my unfamiliarity with these poems but they really struck me as not that great. I found myself thinking that some of these poems wanted to be Shel's poems and were pretending that they weren't anything like Shel's poems when I really felt like they desperately wanted to be. I'm usually not negative in my reviews but this book left a lot to be desired in my opinion. 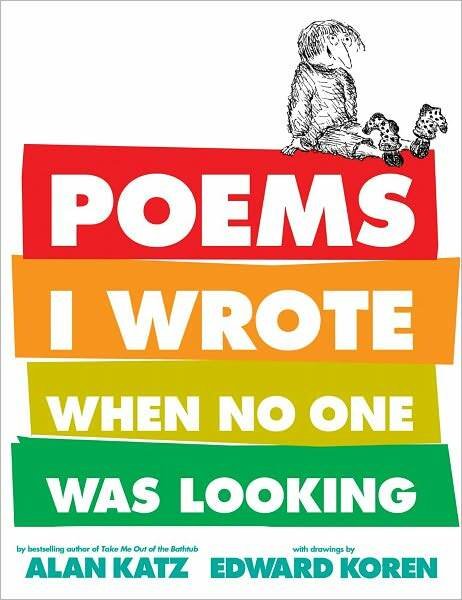 Of the one hundred poems included, there were five I thought would be worth sharing with kids. It made me kind of sad for the poems. One poem I think is fun is "Shhhhh...". This poem is full of onomatopoeia and I can never get enough onomatopoeia. I think onomatopoeia is so much fun. I love sharing onomatopoeia with kids because so often we overlook words that can be considered onomatopoeia. It's fun to talk about it and then challenge kids to pay attention and listen for onomatopoeia. Usually we end up noticing it all over the place, subtly hiding, but this poem definitely brings it to the forefront and bashes you in the head with it. The other poem that could be a talking point for kids is "It Doesn't Compute". In this age of technology, I think this poem is really relevant. I was just talking to my mom about how busy life is and how hard it is to juggle everything as a working mom with two kids and she remarked how when I was growing up things were much simpler. There wasn't the same kind of technology - no checking e-mails at home, no surfing the Internet or Facebook, no writing blog posts. I love how technology brings the world together but it does keep me busy. I immediately thought of Lane Smith's It's a Book! when I read this poem because it also talks about how kids are so accustomed to technology now that something like a book is foreign to them. As a collection these poems didn't speak to me and I'm not sure how much they will appeal to kids. Some of the topics will probably appeal to them but I wonder if some of the last lines will resonate as funny to them. Some of the last lines that were meant to be something akin to punchlines in a poem didn't flow or sound connected with the poems but I would be curious to hear what kids think. no one's free to download me lunch. Writing Prompts: When you are describing using the five sense, try adding in words that sound like the sounds in your scene - how does using onomatopoeia change your writing?